“defame” his character by adding salacious details to his life story. “El Chapo” Guzman Sues Netflix, Univision over Use of His Image. I’m under the impression that he cannot sue for royalties, but would like to know if the actor gets to wear the Barabas shirt. Chapo’s alleged girlfriend, Mexican congresswoman Lucero Guadalupe López, was arrested on conspiracy charges at San Diego airport as she was entering the U.S. in search of asylum. The ex-leader of the Sinaloa Cartel, Joaquín “El Chapo” Guzmán, did not use the financial system, so thus far, no financial resources have been recovered, Mexican Attorney General Raúl Cervantes Andrade said Wednesday. “To date US authorities have not found anything pertaining to the assets of el Chapo. We have realized that he did not use the financial system because we have not found any assets; they have not been able to find a single dollar,” the official said. On the other hand, Jorge Ramos Hernández, a PAN congressman claims the assets total US$16 billion and belong to Mexico. Clearly the guy from the PRI is not talking with the guy from the PAN. Meanwhile, Senator Ted Cruz proposes the El Chapo Act, enabling 14 billion dollars worth of assets from El Chapo and other drug lords to fund the border wall. issued a chart identifying 288 companies involved in Guzmán’s money laundering operations that had been blacklisted by OFAC between 2007 and 2014. The Guzman-linked companies, mostly located in Mexico, covered a broad range of areas including real estate, gas stations, construction and trucking companies, and furniture stores. As I mentioned last month, one of El Chapo’s associates agreed not to contest the forfeiture of nearly $1.4 billion in assets and cash by U.S. authorities, and in 2012 the U.S. Treasury Department put financial sanctions on El Chapo’s wife and son. Does Ted Cruz read Prairie Pundit? 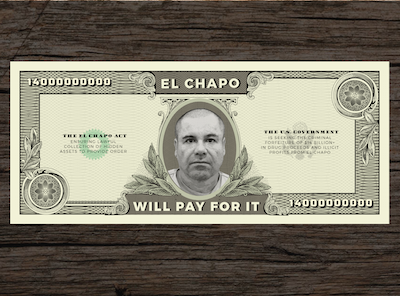 The government is trying to seize the assets of el Chapo estimated to be $14 billion. That is nearly two-thirds of the price of the wall right there. Mexico should go along with this because it would defund the criminal insurgency that is killing their culture. It would have the potential of being a win-win deal. The U.S. Government is currently seeking the criminal forfeiture of more than $14 billion in drug proceeds and illicit profits from El Chapo, the former leader of the Sinaloa drug cartel who was recently extradited to the U.S. to face criminal prosecution for numerous alleged drug-related crimes, including conspiracy to commit murder and money laundering. “Fourteen billion dollars will go a long way toward building a wall that will keep Americans safe and hinder the illegal flow of drugs, weapons, and individuals across our southern border,” said Sen. Cruz. One cooperator, Juan Carlos Ramirez-Abadia, or “Chupeta,” 54, was a leading supplier of cocaine to Sinaloa and BLO through Colombia’s Norte del Valle cartel. He directed the production of business ledgers and was also prosecuted by Goldbarg. DEA agents helped obtain “the forfeiture of hundreds of millions of dollars” of Ramirez-Abadia’s purported billion-dollar fortune, U.S. authorities said when he was extradited in 2008 and remains under U.S. indictment. And then there are his relatives, who are living high off the hog. The department’s Office of Foreign Assets Control said that it had designated María Alejandrina Salazar Hernández and Jesus Alfredo Guzmán Salazar, 26, under the U.S. Kingpin Act, which bars American citizens from dealing with them, and allows authorities to freeze their assets in the U.S. In February 2014, OFAC issued a chart identifying 288 companies involved in Guzmán’s money laundering operations that had been blacklisted by OFAC between 2007 and 2014. The Guzman-linked companies, mostly located in Mexico, covered a broad range of areas including real estate, gas stations, construction and trucking companies, and furniture stores. Under the so-called “Kingpin Act,” American companies and individuals are prohibited from doing business with foreign company flagged by OFAC. Gaddis said that the hard facts that back up the government’s assertion of the $14 billion figure lay in the reporting of DEA files, but they will only be accessible when they are made available to Guzman’s defense as discovery material during pre-trial proceedings. Even half that amount would help. 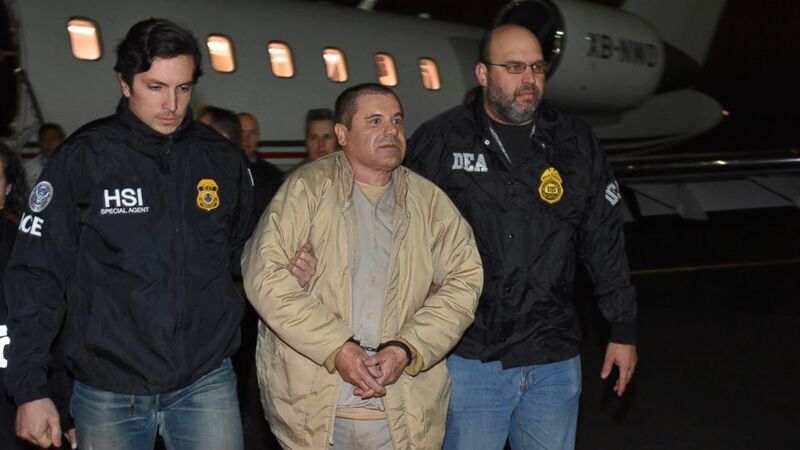 El País reports on The American ‘cage’ holding the world’s biggest drug lord. ‘El Chapo’ Guzmán awaits trial in solitary confinement inside a New York City correctional facility. There is a television set in the room where Joaquín “El Chapo” Guzmán is allowed to exercise for one hour a day, but it is never turned on: his guards, who aren’t allowed to talk to him, can’t decide what he should be allowed to watch. He spends the remaining 23 hours of each day in a small cell with a bed, a table, a chair, a lavatory and a sink. The light is turned on most of the time. The only time he sees daylight is through a small window in the passage between his cell and his exercise room. While El Chapo awaits trial, he is being kept in complete isolation, and can only talk to his lawyers from behind a glass screen. He has no contact with his wife, Emma Coronel, and she in turn is receiving no news about him. He is unaware of the increasingly bloody power struggle taking place within the Sinaloa cartel in the wake of his extradition, or that Mexican actress Kate del Castillo, with whom he wanted to make a movie about his own life, has a new television series. But El Chapo will have seen the documents relating to his own case: that a police officer in the Mexico border city of Juárez is to give testimony about the bribes paid to release members of the Sinaloa cartel; that another witness will talk about a house used for killings, the walls of which were covered in plastic and where a special drain had to be installed for the blood to be washed down; that his stash of AK-47s was found, and that several leading Colombian cartel leaders will also be testifying. No tunnel allowed at the Metropolitan Correctional Center. The Successor to El Chapo: Dámaso López Núñez “El Licenciado”. Mexican Drug Lord Joaquín ‘El Chapo’ Guzmán’s Lawyers Ask for More Access. Since his extradition to U.S., he’s largely been in solitary confinement in a New York prison. Adding to the complexity of the case, the government also raised concerns about Mr. Guzmán’s legal representation by the federal defenders, saying there was a potential conflict of interest because the defenders’ office has previously represented five potential witnesses with connections to Mr. Guzmán. The judge appointed Matthew Fishbein, a partner at Manhattan law firm Debevoise & Plimpton LLP, to help Mr. Guzmán determine whether there is a conflict of interest. Mr. Guzmán’s lawyers have indicated they may challenge the grounds for his extradition. The extradition proceedings in Mexico were not based on the charges in Brooklyn, and “it was assumed” he would be brought to California or Texas, his lawyers said. Before his removal to the U.S., neither he nor his lawyers in Mexico knew the extradition would occur, according to a court filing. 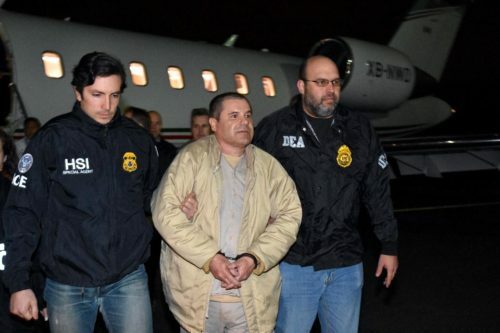 Joaquín “El Chapo” Guzmán landed in the U.S. last night. He will face six indictments throughout the U.S. for 17 counts including homicide, money laundering, and drug trafficking. Two years ago, then-candidate Donald Trump sought FBI protection after El Chapo’s son tweeted a death threat. Mexico Extradites Drug Lord ‘El Chapo’ to U.S. Joaquín Guzmán faces six indictments across the U.S. The Justice Department plans to put the former boss of the notorious Sinaloa cartel on trial in Brooklyn federal court, which is one of the most secure courthouses in the country, according to people familiar with the discussions. These people said the talks to finally get Mr. Guzmán on U.S. soil had accelerated in recent weeks. Mr. Guzmán’s extradition on the last day of the Obama administration came as a surprise, as his lawyers were still fighting extradOition. El Chapo, Mexican Drug Kingpin, Extradited to the U.S. Notorious drug lord Joaquín “El Chapo” Guzmán was extradited to the US on Thursday night as a slap in the face to Donald Trump, just hours before he’s set to take office, sources told The Post. “Mexico wanted to get it done before the proverbial wall was built — both with bricks and bombastic diplomacy by the Trump Administration,” explained a federal law enforcement source familiar with the case. El Chapo’s first court appearance is at Brooklyn’s Eastern District federal court, one of the most secure in the world. On Monday, a federal judge in Mexico gave a green light to his extradition to the US, where he faces charges for murder, kidnapping and drug smuggling. “He will likely be extradited [to Brooklyn] in June. That’s the word,” said a source. In 2014, El Chapo was indicted by a Brooklyn federal jury for allegedly laundering $14 billion in drug money as head of the violent Sinaloa Cartel, which feds called the world’s largest drug-trafficking organization. His lawyer says there are nine appeals against El Chapo’s extradition orders. The wife of recaptured Mexican cartel leader Joaquín El Chapo Guzmán Loera has claimed to have no knowledge that her husband is a drug trafficker. “I am not aware that he traffics drugs. I am in love with him,” said 27-year-old Emma Coronel in an exclusive interview with Spanish-language US television station Telemundo on Sunday. Producers of the proposed show are also angling to reach out to members of the Charles Manson Family and Mark David Chapman’s wife, Gloria Abe. The show would air on Investigation Discovery.